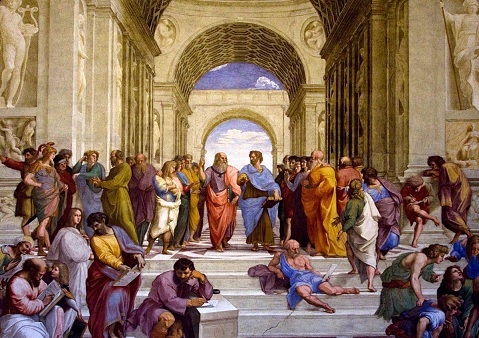 This painting by the Italian Renaissance artist Raphael is called The School of Athens. Plato and Aristotle are at the center. I have been writing an elementary science series that introduces science topics in roughly chronological order. Currently, two of the books are available, and the third is being printed as I type these words. The fourth is finished and is currently being reviewed by two science PhDs and one historian. I have just one more to write. Now that I am near the end of the series, my publisher came up with a great idea. Since there are some excellent history courses that homeschoolers use at the elementary level, he suggested that I write a guide which synchronizes my elementary courses to them. That way, if a homeschooling family wants to, they can learn science and history side-by-side. I thought, “How hard can that be?” After all, my science is presented chronologically, and many of these history programs are presented chronologically. It should be easy to synchronize them, right? Wrong! Science progressed slowly at first and then picked up steam as time went on. As a result, my courses speed through ancient history and the middle ages, slow down a bit in the renaissance, slow down even more in the Age of Reason, and will slow down even more after that. Understandably, this isn’t how most history courses are paced. In addition, my series spends an entire school year using the creation account to provide an overall view of science. Students spend 15 lessons on each creative day in the Genesis account so they have a brief introduction to all the areas of science. This forms a basis for them to then study science in the context of history. Some history programs don’t deal with the creation account at all, and the ones that do spend only a short time on it. Finally, my courses focus on the people who made the scientific discoveries. I try to introduce them in the order of their first major contribution to science, but then I discuss all their other scientific contributions before introducing the next person. Since most natural philosophers made contributions to science throughout the course of their lives, the order is not strictly chronological, especially in the later courses where science was progressing at a more rapid pace. This means the order in which I introduce certain people will be different from the order in which a history course might mention them. As a result of these three issues, perfectly synchronizing my elementary series to a history course isn’t very practical. Nevertheless, I did the best I could for three history series: The Mystery of History, Story of the World, and Tapestry of Grace, Diana Waring’s history, and My Father’s World. If you can think of another series you would like me to synchronize my series to, let me know. Now that I have given you a long, drawn-out discussion of synchronization, let me give you what I consider to be the most practical way to cover history and science together. If you start Science in the Beginning when you start your history series, your science will always be behind your history. After all, you will be spending a year on the creation account, while the history course you are using will spend, at most, only a few weeks on it. If you then just move on to the next book in my series each time you move on to the next book in your history series, your science will review the history you have already learned. This will probably make your science a bit more relevant to the students, and it will probably reinforce some of the historical concepts you learned previously. 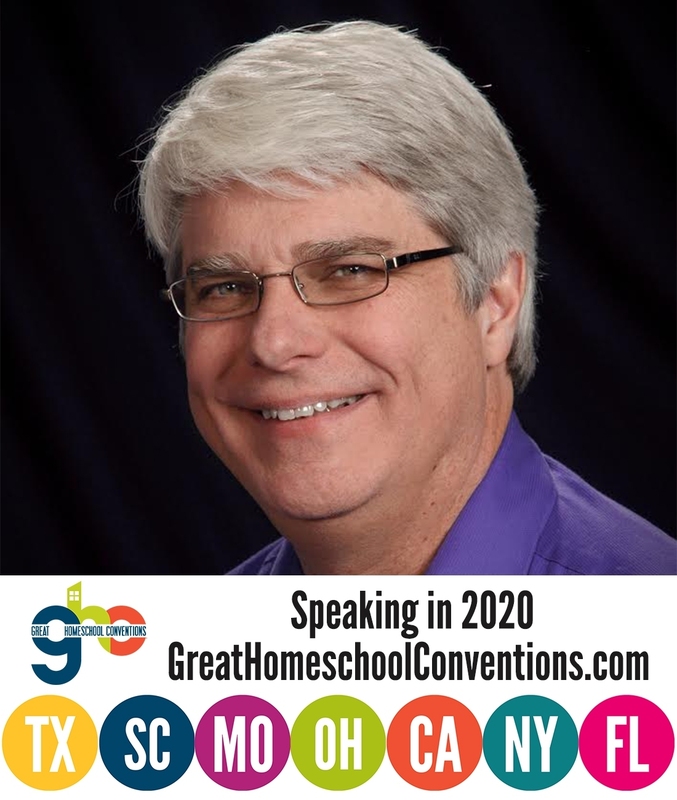 Dr. Wile – my husband and I heard you speak at our first homeschool convention in Orlando a couple of years ago. I enjoyed all your talks and especially appreciated the talk with data and statistics about how homeschoolers are doing academically. Our oldest in now in K/1st and we just did the first lesson in Science in the Beginning today! It was brief enough for my littles (our preschooler enjoyed doing the experiment with us too), simple, interesting, and informative experiment, and understandable lesson! 1. It begins with creation and has a Biblical worldview (certainly need to teach what others think later but science, like any subject or knowledge, is ultimately void without God). 2. It is chronological. We lean classical and use history as our spine (*this article was helpful as I’ve been going through different options in my mind on exactly this topic). 3. It seems to me like studying science in this way will illustrate more clearly than segmented sub-subjects (earth science, chemistry, astronomy, etc) how inter-related the things around us are. 4. It focuses on the people. I think this will be very interesting for the littles and elem. age because it will lend itself to the scientists’ stories. 5. I love that we can ask you questions if we need to! Thank you thank you!! God bless. Thank you, Amanda. I pray that it continues to work well for you! I have been using your series along with My Father’s World, and lined the first 2 books with their history cycle years Creation to the Greeks and Rome to Reformation. This has worked very well for us, and others that I have shared it with. I am eagerly awaiting your 3rd book, The Scientific Revolution, to see how this may need to be modified. Please use and share with my permission! The first 2 sections of Science in the Ancient World are Science Before Christ, Part I &II. These must be done during Creation to the Greeks or over the summer. There are 24 regular lessons (I would skip the challenge lessons). In the last few weeks of Creation to the Greeks you stop Science in the Beginning with lesson 66 and start Science in the Ancient World. Do the first 2 sections of Science in the Ancient World (all 30 or just the regular lessons) before Rome To Reformation. Then I moved some of Science in the Beginning in the first few weeks of Rome To Reformation. Wow, Suzanne! Thanks so much! I will write up a synchronization guide based on this info and include it in the blog post above, giving you credit. I was thinking of using your Elementary Science Curriculum with Simply Charlotte Mason’s History/Geography/Bible lesson plans. This is chronological starting with creation, although only the first 2 lessons go over creation. But the first book includes Ancient Egypt. The second book includes Ancient Greece, 3rd ancient Rome, 4th middle ages/renaissance/reformation, 5th book early modern, and last book modern times. Could this be synchronized? Thanks for the suggestion, Mandy. I will look into it and see if I can synchronize with Simply Charlotte Mason’s History/Geography/Bible lesson plans. Would you consider synchronizing with My Father’s World? SITB is scheduled with the Creation to the Greeks but I would like to see how your curriculum could follow the rest of the My Father’s World cycle. Shelaine, I will post a synchronization guide from them. You can also look at Suzanne’s comment. She has the synchronization worked out for the first two books. I can’t tell you how happy this blog post makes me! My kids (2,5, and7) and I are working through Science in the Beginning. We LOVE it! It is by far our favorite time of the day, and I certainly love that my kids can explain some of the science in the world to friends and family. We have Science in the Ancient World on the shelf waiting to go. Thanks for creating a wonderful, accessible program for the whole family to enjoy! I am so glad you are enjoying Science in the Beginning, J. Wheeler! Thanks for letting me know. We (Simply Charlotte Mason) often recommend your materials so please let us know if we can be of any help. Thank you, Doug. I will contact you via e-mail. I am truly honored to think my work could bless a few more folks. This is the first time I have attempted something like this. Thank you! I have one question for you. After looking over your synchronization of Story of the World (which is used by My Father’s World for 3 years of the history cycle), I realized that if I continue to use Science in the Ancient World throughout the end of this school year, I will not be following your recommendations. Your recommendations are highly appreciated and sought after! Suzanne, you could skip the challenge lessons associated with da Vinci. Those would be 73, 75, 81, 83, and 90. I just realized that my guide may not be the same as what is published in the My Father’s World Teacher’s manual for Creation to the Greeks, since I started using Science in the Beginning before MFW added it to their curriculum. I hope this will clear up any confusion. Have a blessed day! Thanks for your quick reply, Dr. Wile, but we are only doing the regular lessons already. Which of those would you skip? Thanks again! Suzanne, you could also skip 69, 78, 87, and 89. Just wanted to say that a very basic correlation is there for Ambleside Online – although they don’t recommend using a Science curriculum in Elementary…. Year 1 History – introduction to Famous People from various times, as well as 55 BC to 1066AD. I think this works well with Science in the Beginning because of the general overview of history and the general overview of science…. Year 2 History – 1000AD to Middle Ages – Although Science in the Ancient World does start earlier in history, it does come to cover many of the same years. Year 3 History – Late 1400’s-1600’s – Late 1400’s to 1600’s – This fits ‘The Scientific Revolution’ (or whatever the final title will be) – quite nicely…. Year 5 History – 1800’s – 1914 – should fit nicely to science in the 19th century…. Year 6 History – 1 term of modern, then back to Ancients…. doesn’t fit with the science courses…. So not an exact fit – but as users of Ambleside Online use Charlotte Mason methods – they don’t want to force relationships, so an exact fit probably wouldn’t want to be desired. Also, users of AO have all their kids in separate times of history. Still, I think it works out fairly nicely…. Thanks for the correlation, Heather! I have a question. My oldest son (5th grade) is just now starting Science in the Beginning. My question is should we focus more on completing the Elementary series before beginning Exploring Creation with General Science (Junior High)? Thanks. Thanks for your question, Estella. I would not focus on completing the elementary series before starting General Science. When the student is two years away from starting Algebra 1 (usually, that’s seventh grade), the student should start General Science. At that point, science becomes more content specific, so it is important to start covering the content that needs to be covered. This year my children and I are using your Science in the Beginning 1-2x a week. We are enjoying it a lot! Next year we are beginning Diana Waring’s History Revealed. Do you have any ideas how your elementary series could fit with her curriculum? We are planning to take more than a year to finish each of her guides. Katie, I am working on that right now. It should be available on the publisher’s website soon. I’ll link to it here and try to remember to send you a link via e-mail when it is up. Y’know, your books are great, Dr Jay, and although I appreciate the efforts you expended on the history guides — I’d like to reassure people that your lessons do not have to be in synch with the history. For UK users, Your course fits with our way of learning Biology, Chemistry and Physics at the same time. Thank you for all your wonderful work to bless us as we learn along with our children! Thank you, Anthea. I am glad that the courses are working so well for you! That makes a lot of sense what Anthea and Dr. Wile is both saying. I really appreciate that I don’t have to worry so much over this. Our family has been using Truthquest for history for the past 3 years and plan to use it through graduation. The first three years is spent learning about American History then it goes back to the Beginning of History (from the Bible) and works it way through ancient history, Egypt, Greek, Roman, Middle Ages, Renaissance and Reformation, and then back to the Age of Revolution for three years in high school tying in what is happening in America and in Europe. I don’t know how to tie in science to this history schedule, but I don’t think I will even attempt it. We will be starting the Science in the Ancient World this summer. Loved the first book! Thanks so much for this curriculum. Thanks, Jeannie. I will look into Truthquest, but based on how you describe it, I suspect it would be hard to synchronize.